Sure to cure your food cravings, these cereal snacks are so easy to Skof through because of their tasty spicy tomato flavour and great munch. Base (Wheat Flour, Wheat Starch, Salt, Colour (E160A)), Palm Oil (Antioxidant (E319)), Spicy Tomato Flavoured Seasoning (Sugar, Vegetable Powder, Salt, Rice Flour, Wheat Starch, Acidity Regulators (E262, E330, E260), Lactose, Glucose. 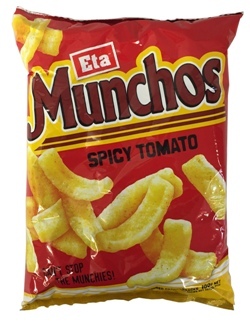 Got my pack of Munchos today for my fiance, it is his favorite NZ snack when he still lived there, I snag some and gave it a try, they do taste alot like tomatoes little bit sour, but a nice kind of sour, its here for only an hour or so and my Kiwi almost munched it all away!